Flyhoward Ltd is an independently owned software company that specialises in programs for the aviation industry. Due to the high volume of spam reaching us, we do not publish our email addresses on this site. As a result, it is necessary to go through our mail form to establish the first contact. We apologize for the inconvenience. Please visit our Contact Us Page if you wish to send us an email. 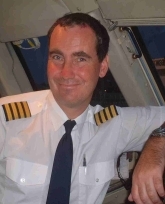 Howard Birch is an airline pilot with over 20 years flying experience and has flown light aircraft, air taxi, large turboprops and Boeing 737, 757 and 767 aircraft. He has worked for several airlines and has also held the position of technical pilot where he was responsible for creating mass and balance loadsheets, aircraft performance calculations and other technical areas of airline operations. Howard has been developing software for over 10 years, for both personal use and to provide software solutions for the airlines he has worked for.